A banner ad for Democracy 3 was deemed unsuitable to run on a major U.S. games site because politics is a sensitive topic. Go to any big gaming site and you'll see ads for all kinds of games, many of which involve the infliction of horrific violence upon people who may or may not deserve it. What you won't see on at least one "major U.S. gaming site," however, is an ad for a game in which political mandarins make back-room deals to influence the mindset of the voting public. Because that, you see, would be inappropriate. 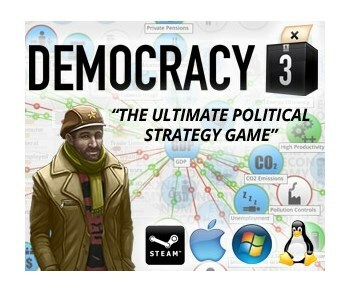 Cliff Harris, the founder of Positech Games, reported on his blog yesterday that an ad for the recently-released Democracy 3 was deemed by a "BIG game-advertising agency" to be inappropriate to run on a particular website. When Harris asked why, he was told, "We can not promote any politics as this is a sensitive topic." It's kind of silly in and of itself, given that the agency presumably had no such qualms when it signed up to handle "the ultimate political strategy game," but Harris also made the rather obvious point that an awful lot of other games don't face the same restrictions. "I bet ads for games like Hitman, or GTA, or games where you get slow-mo closeups of people's skulls being blasted apart by high-caliber bullets are just fine. But discuss income tax? OH NOES THE WORLD WILL END!" he wrote on his blog. "It's stuff like this that sometimes makes me ashamed to be in this industry. Half of the industry wants to be grown up and accepted as art, the other half have the mentality of seven year olds. I'm pretty cynical, but I never expected my ads for a game about government-simulation to be too controversial to be shown (for money no less...)." There's not really very much to add to this, is there? And it's not just games like GTA and Hitman that pass muster while Democracy does not: I've never heard of a Civilization release getting hung up because of inappropriate content, yet politics is a core component of the gameplay. It's an obviously ridiculous scenario, and maybe someone with a whit of common sense will reverse it at some point, and yet for now, so it stands.